Things were simple for Pearl, Kat, Bea and Betty when they were at the Little Ladybirds Nursery. They were best friends and did everything together. Now though, they are at high school, and year 9 is dire. Pearl is one of the most popular girls at school and hates Bea with a passion, Betty has found her own weird and wonderful way in the world and her and Kat are no longer on talking terms. Now Starwars’ Dance Series has come to their town and is threatening to make things even worse between the girls. Kat goes off with Pearl to create the perfect girl group and Bea is left alone, wishing she could fight back. When Ollie Matthews, hottest guy at school and also Pearl’s boyfriend, decides to compete with Bea, she has the perfect weapon to battle with. I am usually one to shy away from contemporary fiction about girls who hate one another, boys who are described as uber-hot and talent shows, so this book shouldn’t even be in my house let alone on my read-pile. I was sent it unsolicited and to be honest the only reason I picked it up was because it was short and I needed something fast and easy to read. Now I am so, so glad I did! This book blew me away. The main character is ridiculously relatable and has the cutest, funniest little sister in the world. Her family is great and even though her dad doesn’t appear once, he is present and not a moron. The storyline is interesting because you never quite know whats going on between some of the other characters and whilst the talent show thing is a little bland, I loved what Bea and Ollie did to make it their own. The type of music and dancing talked about really got to me because I love all things 50s and happen to thing Jive and Swing songs are some of the best ever written. The serious aspects of the book include learning to be, and love, yourself, bullying and dealing with relatives getting older and they are all handled brilliantly well. The romantic relationship that develops within the book was very well done too with the characters actually getting to know one another and actually talking before anything is even suggested. As I said this book is fast and easy. The proof copy I had was only 175 pages and took me a grand total of about an hour and a half to read. The writing was pretty simple but in an everyday life kinda way, not a childlike kinda way. I really liked the way Bea’s feelings came out in the writing and how things seemed to speed up when she was dancing and performing; her emotions were ever present. The only thing I disliked about the book was Bea’s tendency to forgive certain people too easily, but even that was worked on during the time the story was set and I liked that she became a much stronger person. I think a lot of real life was captured really well in this book and whilst some aspects of the storyline are a little unbelievable others were spot on. I really do recommend this book to any budding dance or sing star out there. Its a fun, realistic teen story that tackles a lot in its few pages but does it all pretty well. I think tween wannabe superstars would love it so definitely any year 6s or 7s out there who want to sing like the stars should read it! 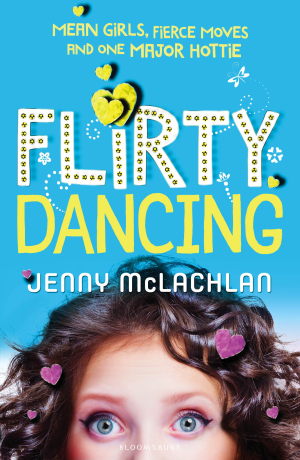 Flirty Dancing will be published on July 3rd by Bloomsbury Children’s books. My copy was sent to me from the publisher in exchange for an honest review.